Little known outside of Japan and Portugal is the fact that the first Westerners to set foot on Japanese territory were actually the Portuguese. In 1543, Portuguese sailors and merchants landed in Japan introducing, among other things, weapons that used gunpowder. A fact that would significantly change how wars were fought on the archipelago from then on. For the succeeding 100 odd years, Portuguese were the dominant western presence in Japan and known as the nanban-jin, barbarians from the South. 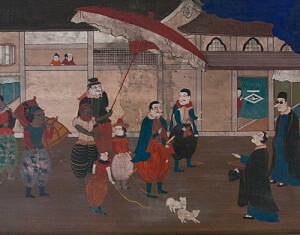 Around the same time, Jesuit priests who operated closely with the Portuguese empire also travelled to Japan and ardently carried out their mission of converting the native people. The rulers of Japan, fearful that Christianity would become a capable force to topple their rule, quickly decided to expel the missionaries and in 1639 the bakufu decided to expel the Portuguese all together as they were seen as being too close to the Christian cause. From this point onward, it was the protestant Dutch who would be the only Westerners allowed to conduct their commercial activities in Japan, working from an isolated outpost created just outside Nagasaki, called Deshima. The Dutch retained this privileged status until Commodore Perry’s fleet arrived at the shores of Japan in the mid-nineteenth century. This part of Japanese history is more widely known. Some delicacies still popular in Japan such as tempura, seafood and vegetable fritters, and castella, a baked cake made of egg and flour, are said to have come originally from Portugal. However, the history around the Japanese-Portuguese bilateral relationship pretty much ends there, and it would not be an exaggeration to say that little effort was exhorted to strengthen the relationship from either side. This stagnation ended last year in May when Prime Minister Abe Shinzo became the first Japanese prime minister to pay an official visit to Portugal as the head of the Japanese Government. Since that moment what can be labeled as a Japan boom has emerged in Portugal. Official visits by senior members of the two governments, as well as by those from the private sector, are multiplying, and various events are taking place surrounding these visits. One such occasion was a recent colloquium titled ‘ Japan, Portugal and EU cooperation: strengthening foundations for tomorrow’s challenges’. 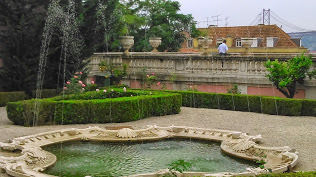 The Portuguese Foreign Ministry hosted the event at their official guest house, Palácio das Necessidades, in Lisbon on 28 October 2014. The aim of the one-day conference was to revisit the history of Japan-Portugal and Japan-EU relationships in the political, economic and cultural spheres, and to identify what we should be focusing on to collectively tackle future challenges. As the Executive Director of the Sainsbury Institute, I was invited to take part in the colloquium. One of the objectives of our Institute is to widen our network within Europe so this was a wonderful opportunity. The event offered such an opportunity for opening new relations that I decided to curtail a visit to Japan and returned to Europe briefly for three days to attend the event before flying back to Japan again. To my surprise, not only was I requested to deliver a presentation under the title ‘ International Cultural Exchanges and the Japan-Europe Relationship’, but I was also asked to be the first speaker of the day. This was indeed an honour, but I was anxious about what precisely could I talk about until pretty much the last minute. Why? The answer was quite simple. The bilateral Japan-Portugal relationship has not been vibrant since the 17th century, and turning our eyes to the Japan-EU relationship the early conclusion of on-going negotiations for an Economic Partnership Agreement (EPA) was the focal topic. In terms of cultural exchanges, to be frank, there were no pressing issues to be addressed. Finally, I came to the conclusion that using my privileged position as the number one speaker of the day, I might try to stir the debate a bit by talking about a universal and rather provocative theme on whether international cultural exchanges really mattered. This is indeed an issue that has been a deep concern of mine for some time. There are many forums where the importance of international cultural exchanges is stressed and I have yet to meet anyone who denies this in an outright manner. Yet, if one looks at the budget of developed countries, including Japan, the clear tendency is to reduce the amount of funding directed to this area. This appears to be a move contrary to the general statement of support for the cause of international cultural exchange. There is also a growing tendency, at least in the case of Japan, to focus more on the promotion, if not propaganda of, the nation’s policies. Would it be unfair to say that the Cool Britannia and Great Britain campaigns in the UK belong to the same genre? There is certainly nothing wrong in sharing aspects of one’s proud culture and feelings that such sharing will contribute to the betterment of humanity. At the same time, the traditional method of delivering a certain government-led message may seem to others to be somewhat out of date. Bilateral or even multi-lateral dialogues, which are also critical, should be the preferred modality of international cultural exchange in the 21st century. Furthermore, the ultimate goal of these exchanges needs to be aware of diversity and to be able to accept and celebrate differences. In a nutshell, I firmly believe that when we promote culture the mantra should be: ‘ more is better and different is important’. This themes formed the gist of my presentation and it seemed that my message did have a certain resonance. 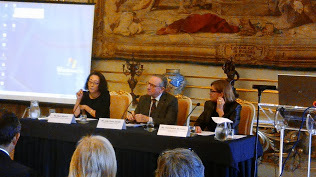 The topic of the second panel concerned EU-Japan political and economic relations. The speaker, Mr Mauro Petriccione, who was the chief negotiator for the EU-Japan EPA, referred to my presentation in an interesting way. He started by saying that ‘ trade is also culture’ and hence ‘different is important’ in trade as well. Mr Petriccione spoke about the 1980s when Japanese direct investment poured into numerous UK and Europe constructing factories. The stark difference in Japanese management methods from what was traditionally believed to be the working system in Europe came as a cultural shock to the Europeans and the process of adjusting to new norms was a painful one. However, he said upon reflection, the injection of this shockingly different approach to manufacturing and business was the best thing that could have ever happened to boost the European economy. Mr Petriccione went on to mention in a diplomatic way that now it was Japan’s turn to accept different models of business coming from the EU, which would lead to a conclusion of the EPA. The connection made between culture and trade was quite revealing. It gives one pause to think that probably all activities, be they economic, political or social, are in some manner all inherently tied into our respective cultures.